Anyway, one fine way to learn about a different place or culture is to actually see how they make something they’re well known for, like Murano glass or Swiss chocolate. Not one to forego a teachable moment, I thought it a wonderful opportunity to visit a master violin maker’s workshop while in Mittenwald, Germany, with my young kids. Stringed instruments were originally developed in Europe during the Middle Ages, and Mittenwald has been acclaimed for its violin-making since the 18th century. Craftsmen are trained first as apprentices and then gradually become masters at Mittenwald’s renowned State School for Violin Making. Many violin workshops inhabit the city and several allow visitors to watch them work. My daughter, who plays the viola, was intrigued by the intricacy and fine detail of the art. What's impressive is that the craft hasn't changed much over the centuries. The luthiers (yes! we learned that word there! it means a stringed-instrument maker) use the same wood tools, brushes for varnishing, and woodcarving knives as the old masters did. 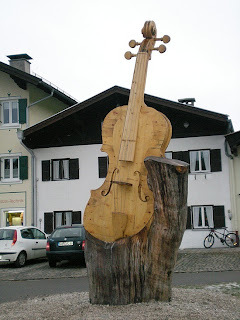 Mittenwald’s tourist office provides a list of violin makers who allow visitors. I recommend this very cool little excursion!